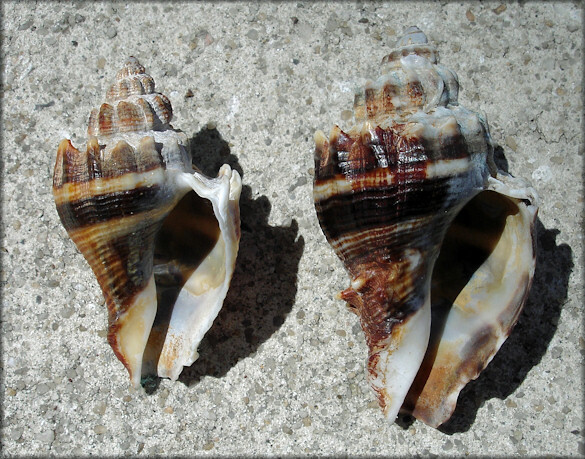 These empty shells (measuring 58 and 68 mm., respectively) were collected by Brian Marshall in shallow water along the shoreline of Amelia Island, Nassau County (Nassau Sound) during a minus tide on June 5, 2008. This is the first known find of this species in Nassau County and they represents only the 5th and 6th specimens to be found in Duval/Nassau County waters. An additional broken specimen was found by this reporter near oysters in the same general area on January 16, 2014.